Hidden things to you and me. The Ipswich River Sanctuary in Topsfield is the largest Audubon Society Preserve in Massachusetts encompassing 2,800 acres. There are 12 miles of interconnected trails winding through a landscape shaped by glacial activity 15,000 years ago. A co-worker told me that the smaller birds were so used to visitors that they would eat from your hand, something that I had to experience. For years I’ve fed birds at the feeder and only occasionally would have a brave chickadee alight on my hand to grab a sunflower seed. 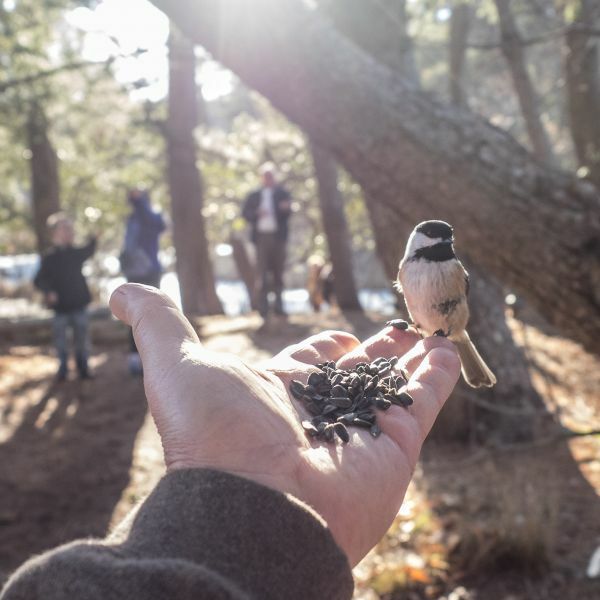 It was quite thrilling to have chickadees, tufted titmouse and nuthatches gather as we walked the trail. We walked along the Rockery Trail which features a grotto constructed in 1905 of large boulders. It was originally part of an arboretum at Bradshaw Farm which featured exotic trees. The land was donated by the owner Thomas Emerson Proctor (1873 -1949) to the Audobon Society. A staff member mentioned that the Society had removed the non-native trees but on the trail I noticed several varieties that I have never seen before in the Northeast. The weather was ideal for our visit, unseasonably warm for the last day of January with no ice or snow to negotiate on the board walks. There were many families with young children, all with their hands outstretched with bird seed and feathered diners. This venue is highly recommended. We plan to return.